Winner of four academy awards in 1977 including Best Picture, Annie Hall is considered Woody Allen's Magnum Opus. Written directed and starring the man himself, Woody Allen, as Alvy and co-starring the lovely Diane Keaton as Annie, the film follows the two as they fall into and out of love. Often regarded as the best romantic comedy, the jokes are witty and playful. Alvy is a timid and paranoid man that loves New York, while Annie is continuously seeking more to life than what is comfortable. 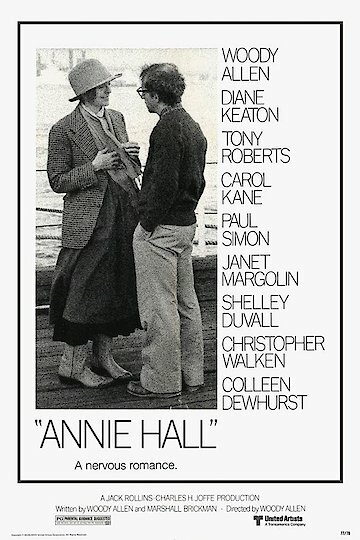 Annie Hall is currently available to watch and stream, download, buy on demand at Hulu, Netflix, HBO NOW, Amazon, Vudu, Google Play, iTunes, YouTube VOD online. The director is reportedly struggling to get financing for a new project. One of Hollywood's most iconic actresses, Diane Keaton, admits that desperation for a role as an understudy sparked a five-year battle with bulimia. Keaton shares her struggle in a new memoir, "Then Again," set to be published on Nov. 15.